We were at Conboy Headquarters on 5/13 and saw that there has been a very recent controlled burn of the forest understory along the entrance road from the highway to the headquarters (Wildlife Refuge Road). On 5/13 there was a fair number of smoldering spots and a crew was present to attend to hot spots. The burn extends from the highway to within less than a quarter mile of the headquarters buildings. We hiked the Willard Springs Trail. The woods along the east portion of the trail, the segment of trail that runs alongside the meadow, are unaffected by the burn. The west segment that runs from the observation platform back to the entrance road is unaffected for the first half (northern half). The half mile or so of the trail just north of the road is the eastern boundary for the burn. To the west the understory has been burned, to the east it has not. The burn has eliminated the brushy understory. There was no birdlife in the burn area the day we were there. This is the area where we have often found Gray Flycatcher in the past. It seems likely that this area will be a lot less birdy until some of the understory grows back. The headquarters area and Willard Springs Trail are still very birdy and we had an excellent day. We were even treated to one of the scarce Cassin's Finches singing from the top of a short conifer in the parking lot. East of Mount Adams, the Klickitat River drains a large basin southward, reaching the Columbia River gorge at Lyle. With its rolling hills, dry mixed Garry Oak/Ponderosa Pine forests with patches of Ceanothus and other shrubs, this country has habitats and some bird species similar to those of interior southern Oregon and northern California. Acorn Woodpecker and Lesser Goldfinch reach their northern range limits here (although Lesser Goldfinch is expanding its range within the state). Other breeding species with southern affinities are Anna’s Hummingbird, Lewis’s Woodpecker, Ash-throated Flycatcher, Western Scrub-Jay, and White-breasted Nuthatch. 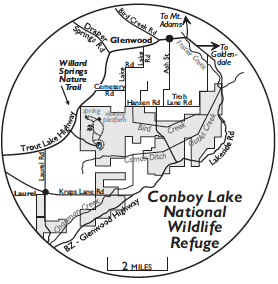 Conboy Lake National Wildlife Refuge has the full complement of Eastside habitats, including Ponderosa Pine, pine/oak, mixed conifer, aspen groves, riparian, canals, grassy prairies, marsh, and wetland meadows. The small population of breeding Greater Sandhill Cranes at Conboy Lake is expanding into neighboring areas. Special bird encounters include Flammulated Owl, Red-naped Sapsucker, White-headed Woodpecker, Least and Gray Flycatchers, Eastern Kingbird, and Pygmy Nuthatch. The Columbia Hills is designated by Washington Audubon as an Important Bird Area (IBA) for wintering raptors. During migration and winter, waterfowl are plentiful and diverse along the Columbia River sloughs, which always provide interesting sightings. The east end of the Columbia River Gorge includes basalt cliff habitats with breeding Golden Eagle, White-throated Swift, Peregrine and Prairie Falcons, and Rock and Canyon Wrens. Be aware that Poison Oak is especially abundant in the woodland understory. Western Rattlesnakes are common throughout, particularly near rocky areas. 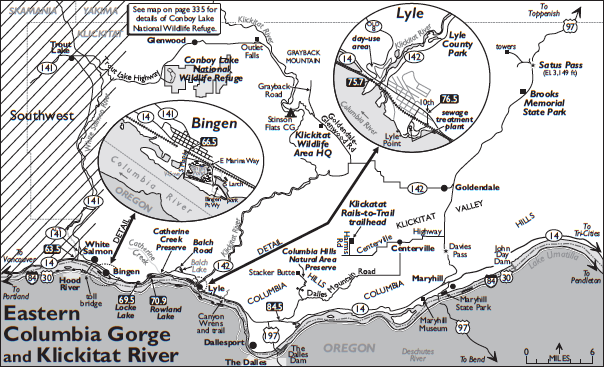 Site descriptions begin at the eastern Columbia Gorge, specifically in Bingen where the western Gorge leaves off (page 250). We proceed upriver to the eastern terminus of the Columbia River Gorge National Scenic Area near Maryhill. Mileposts markers along SR-14 serve as our reference points. Driving east on SR-14, cross the White Salmon River bridge (milepost 63.5). In less than two miles is the turnoff for the toll bridge to Hood River, Oregon. Continue east on SR-14 into the town of Bingen. At milepost 66.5 (just east of the Shell station), turn right onto Maple Street at the sign for the Port of Klickitat and Bingen Marina. Cross the railroad tracks and continue straight ahead on South Maple, which ends just ahead at the Columbia River. From this street, there are clear views of Bingen Pond (east side) and the V-Cove (west side), surrounded by weedy thickets. Purple Martins nest within pylons along the water’s edge. The main attractions are waterfowl and winter sparrows. Fox, Song, Lincoln’s, White-crowned, and Golden-crowned are common. Swamp Sparrow is rare but regular. Rarer still are the Sagebrush, Red Fox, White-throated, and Harris’s Sparrows. Trumpeter and Tundra Swans, Northern Shoveler, Northern Pintail, Green-winged Teal, Canvasback, Redhead, Ring-necked Duck, and Greater and Lesser Scaups are regular in winter. A Tufted Duck wintered several years running. Lesser Goldfinch can be found here year round and has nested nearby. A trailhead from South Maple Street wraps around the south end of the pond. Willows and cottonwoods can hold an overwintering Red-shouldered Hawk, roosting owls, or migrant passerines in season. Scan other Bingen Marina backwaters of the Columbia River by returning on South Maple and turning right onto East Marina Way, right again onto South Larch Street, and finally left (east) along East Bingen Point Way to a small park at Bingen Point. Eastward on SR-14 at milepost 69.5, Locke Lake is divided in two by the highway. The southern half hosts flocks of ducks in winter. In migration, the oak forest here can be good for warblers and other passerines. Turkey Vultures soar in circles overhead, an occasional Golden Eagle may be seen overhead, Canyon Wrens sing from the cliff face, and nests of Bullock’s Orioles dangle from the oaks. 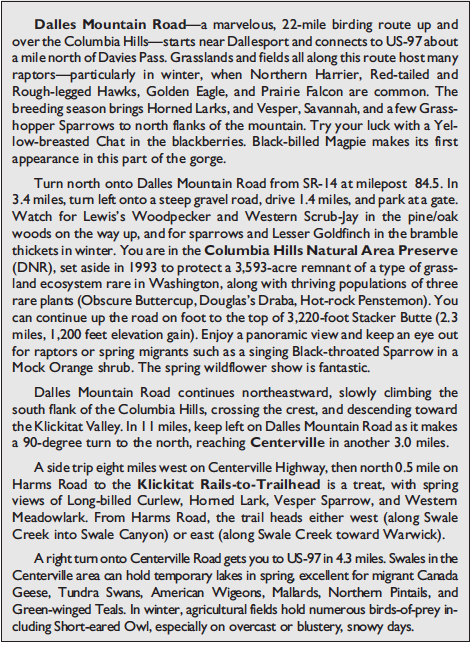 Courtney Road, at the west end of the lake, leads steeply up Burdoin Mountain through oak woodlands and eventually mixed conifer featuring Sooty Grouse near the junction of Atwood Road, Wild Turkey, Say’s Phoebe, Western Bluebird, Nashville Warbler, and Lesser Goldfinch. Columbia River views from this road are breathtaking and worth the two-mile drive. At milepost 70.9, the highway bisects Rowland Lake, used by wintering waterfowl and loons as well as by breeding Osprey, Red-tailed Hawk, and Peregrine Falcon. California Quail, Lewis’s Woodpecker, and Ash-throated Flycatcher frequent the oaks along the shore. Turn left onto Old Highway 8 and drive around the north side of Rowland Lake and east for 1.5 miles to parking for the Catherine Creek Trailhead. This is a paved, all-accessible trail on the north and south sides of the road through approximately 1,000 acres of oak/pine woods, cliffs, Poison Oak thickets, grasslands, basalt cliffs, and vernal ponds, owned by USFS. A trail heads uphill (north) across open slopes, which are ablaze in spring with colorful wildflowers, to a massive basalt arch providing a grand view of eastern Columbia Gorge. Turkey Vulture, Bald Eagle, Red-tailed Hawk, and American Kestrel are noted soarers over the cliffs. The grasslands are alive with Western Kingbirds, Tree Swallows, and Western Bluebirds vying for limited nesting cavities, the dry trill of Chipping Sparrows, the paired notes of Lazuli Buntings, and the melodic song of Western Meadowlarks. Continue eastward on Old Highway 8, checking the oaks and fields for Lewis’s Woodpecker, Western Scrub-Jay, and Lesser Goldfinch. In 1.8 miles, turn left onto Balch Road. Stop at the Lyle-Balch Cemetery in 0.4 mile; shrubbery outside the cemetery is prime habitat for Lesser Goldfinch. Also, find singing Lark Sparrows, Lazuli Buntings, and American Goldfinches. Watch Chipping Sparrows collect grass rootlets for its nest. After the cemetery, keep right at the fork in 0.2 mile. Visible from the road a short distance ahead on the right, Balch Lake is reliable for Wood Duck and Hooded Merganser. Ash-throated Flycatcher and Lesser Goldfinch nest in the surrounding oak and pine forest. This area is closed to the public to protect a small population of endangered Western Pond Turtles. Continue about a half-mile back to Old Highway 8. Turn left (east) and stop at the second power pole, about 100 yards from the Balch Road corner (very narrow shoulder; parking on Balch Road is safer). Look one-quarter mile south for a lone Ponderosa Pine snag riddled with holes, an Acorn Woodpecker granary. The woodpeckers are often seen on or near the snag—if you are lucky, even flying between it and the woods to the north of Old Highway 8. A scope and patience are requisites for success. Continue on Old Highway 8 east for 2.0 miles to Balfour-Klickitat Day Use Area (see Lyle inset map), a U.S. Forest Service park that is chock full of weedy grassland for hungry Lesser Goldfinches and oak/pine filled with Yellow-rumped Warblers in spring; Osage Orange and Sumac hedgerows block the wind. A trail heading northeast from the parking area leads to a wildlife-viewing nook above a small, protected cove of the Klickitat River, where Bald Eagles congregate in winter and an Anna’s Hummingbird maintains a resident territory. During spring and fall migrations, see Cinnamon Teal, Spotted and Solitary Sandpipers, and Greater Yellowlegs at the cove. Near the parking lot and along the paved trail to the south, scope the Klickitat River delta to view large flocks of birds during migration: Common and Red-breasted Mergansers, Double-crested Cormorant, Semipalmated Plover, Sanderling, Baird’s Sandpiper, California Gull mixed with other assorted gulls, and Caspian and Common Terns. In 0.2 mile, Old Highway 8 rejoins SR-14 at milepost 75.7. Turn left, cross the Klickitat River, and in 0.1 mile turn left again onto SR-142. Drive 0.8 mile and turn left into Lyle County Park (unsigned). Take the one-lane dirt road that intersects with the Klickitat Walking Trail (signed) and leads down to an overlook of the Klickitat River. Year-round residents of woods and stream include Wild Turkey (most easily seen at dawn), Anna’s Hummingbird, Lewis’s Woodpecker, Western Scrub-Jay, Bushtit, and White-breasted Nuthatch, joined in summer by Osprey, Spotted Sandpiper, Vaux’s Swift, Ash-throated Flycatcher, Nashville, MacGillivray’s, and Black-throated Gray Warblers, Western Tanager, Black-headed Grosbeak, and Lesser Goldfinch. Common Goldeneye may be on the river in winter, and Bald Eagle is common at that season. Anna’s Hummingbird can also be found by searching for feeders at residences in Lyle. From the intersection with SR-142, take SR-14 east 0.6 mile and turn right onto 10th Street (milepost 76.5). Drive through the railroad underpass to the tiny Lyle sewage treatment plant. In winter, Lesser Goldfinches sometimes forage in weeds near the sewage lagoon, while blackberry thickets on either side of the railway embankment swarm with White-crowned and Golden-crowned Sparrows. West a few hundred yards beyond the lagoon is Lyle Point with weedy grassland and river frontage. The Columbia Hills dominate the Washington side of the Gorge for nearly 50 miles, from the Klickitat River to Rock Creek. The river is less than 300 feet above sea level along this stretch, while the high point of the hills is above 3,000 feet. Goldendale and the Klickitat Valley, across the summit, are at an elevation of around 1,600 feet. Headed north on US-97, traction devices may be required in winter between the Gorge and Davies Pass. SR-14 goes through a pair of tunnels on the eastern outskirts of Lyle. Stop at the small parking area 0.3 mile beyond the east portal of the east tunnel to look for Canyon Wren on the steep cliffs. In winter, Gray-crowned Rosy-Finches can sometimes be found along the railway tracks, feeding on waste wheat blown from the numerous passing trains. Hikers will enjoy the Lyle Cherry Orchard Trail, which begins here and climbs steeply more than 1,000 vertical feet to the ridge above the river—the western extremity of the Columbia Hills. Lesser Goldfinches are fairly common along the trail in the breeding season; look also for Western Scrub-Jays. Views of the Gorge are incredible. The weedy fields around the Maryhill Museum (open March 15 to November 15) are a good place to look for Lesser Goldfinch. The entrance is on the south side of SR-14 at milepost 98.8, two miles west of the intersection with US-97. Still another possibility for this species is Maryhill State Park (Discover Pass required). From SR-14, take US-97 south toward Oregon (intersection half a mile east of the one for Goldendale). Turn left into the park in 1.6 miles, just before the Columbia River bridge. Go past the left turn onto Maryhill Highway, which parallels the park’s north boundary, to the park entry booth. There are two places you can park from which to explore the park and its brushy surroundings: the graveled area near the entry booth and the day-use parking area 0.6 mile east. This area is a migrant trap in spring and fall. Late fall rarities have included Red-throated Loon, Black-legged Kittiwake, and Lesser Black-backed Gull. Goldfinches are often noted in the weedy growth and trees by the entrance kiosk or in surrounding fields. Look also for diving ducks on the river in winter, especially Barrow’s Goldeneye. Return toward the entry booth, turning right just before reaching it. Turn right onto Maryhill Highway. Drive slowly through the many orchards. This is private land, but you can park at fruit stands or at the historic church at one mile to scan the apricot and peach trees. At two miles, you will be entering U.S. Army Corps of Engineers land on a road that continues for five more miles (1.7 of which are gravel) with many places to stop. Scan the rocks for Rock Wren or the river for waterfowl, loons, and grebes in winter, and Bald Eagle and Osprey. The road follows the river closely until it reaches a copse at 4.8 miles. Trees and brush line the river for a quarter-mile here and are often productive. Pull in and park. Bullock’s Orioles nest here, and it’s a good place for small passerines in migration. As you continue east, you will see an island below the dam on which Double-crested Cormorant, American White Pelican, and various gulls may be found when the water is low, summer or winter. Follow the road up the hill past the dismantled aluminum plant 2.2 miles to reach SR-14. West of Goldendale is the Klickitat Wildlife Area, 14,000 acres of rugged canyons, Garry Oak groves, and park-like grasslands interspersed with Ponderosa Pine, Douglas-fir, and Quaking Aspen thickets. These diverse habitats support good populations of gallinaceous birds (California Quail, Chukar, Ruffed and Sooty Grouse, and Wild Turkey). Red-tailed Hawk, Golden Eagle, Lewis’s Woodpecker, American Kestrel, American Dipper, Nashville Warbler, and Lark Sparrow are also common. A Discover Pass is required in the wildlife area. To get there, travel west from US-97 in Goldendale on SR-142 for about 11.5 miles and turn right onto the Glenwood Highway. (Coming up the winding canyon from Lyle, this intersection is on the left in about 24 miles.) Four miles from the intersection, turn left onto Soda Springs Road—a gem and part of the wildlife area. The cottonwood, meadow, and oak/pine woodlands here provide excellent birding: Calliope Hummingbird, Gray and Dusky Flycatchers, Nashville, MacGillivray’s, Yellow-rumped, and Wilson’s Warblers, Spotted Towhee, Chipping and Golden-crowned Sparrows, Oregon Dark-eyed Junco, Black-headed Grosbeak, and Lazuli Bunting. Back on the Glenwood Highway, drive 1.3 miles and turn right onto unmarked Grayback Road (5.6 miles from SR-142). You can drive north on this dirt road through grasslands and pine/oak groves for slightly more than two miles, where it abruptly deteriorates (keep left at the fork in 0.5 mile). Watch for Gray Flycatcher, especially in the first mile. Western and Mountain Bluebirds nest in boxes along the road, and all three nuthatches and Hermit Thrush can be found in the woodlands. Many other species are present in May and June, including Western Wood-Pewee, House Wren, and Vesper Sparrow. The views of nearby Mount Adams and of Mount Hood in Oregon are memorable, as is the spring wildflower display. Proceeding westward, the Glenwood Highway soon begins a dramatic descent into the Klickitat River Gorge. Lazuli Bunting is common along this stretch as are raptors such as Bald and Golden Eagles and Cooper’s and Red-tailed Hawks. Near the bottom of the descent (4.3 miles), turn left (south) onto a gravel road that drops down one mile through stately oaks to primitive Stinson Flats Campground (Discover Pass required), where lush growth and the Klickitat River attract diverse birds from Golden Eagle and Spotted Sandpiper to Yellow Warbler and Bullock’s Oriole. The river, originating from melting glaciers and snowfields on Mount Adams, is famous for its Steelhead—an anadromous trout with a life cycle similar to that of most salmon. Continuing toward Glenwood, the road soon crosses the Klickitat River (1.1 miles from the Stinson Flats turnoff). Leidl Campground at this bridge is also a good stop. Here begins the long ascent out of the gorge. An overlook of Outlet Falls is reached by driving right from the highway onto an unmarked dirt track (6.2 miles), then along this to another junction (0.2 mile) and right to a parking turnaround (0.1 mile). Walk several hundred feet down to a fenced observation point with spectacular views of the Klickitat River and Outlet Creek. Birds of cliffs and Douglas-fir forest can be found here, including Turkey Vulture, Vaux’s Swift, Cassin’s Vireo, Violet-green Swallow, Townsend’s Warbler, and Western Tanager. Conboy Lake National Wildlife Refuge, established in 1964, occupies over 6,500 acres of meadows, marshes, and woodlands in a high basin south of Glenwood. It can be reached via SR-142 and Goldendale-Glenwood Road or via SR-141 and the Trout Lake Highway. The small community of Glenwood sits about six miles west of Outlet Falls, described above. Drive west through Glenwood for about a mile and find Trout Lake Highway on the west side. Turn south here and drive 4.8 miles through Ponderosa Pine forest to the main refuge entrance, on the left at Wildlife Refuge Road. If coming from the west, you will find this entrance on your right about 10 miles east of Trout Lake. Drive to the refuge headquarters parking lot (1.0 mile). An amazing variety of bird species is present along the two-mile Willard Springs Nature Trail loop, especially in May and June. The Ponderosa Pine forest here has White-headed Woodpecker, Gray Flycatcher (Wildlife Refuge Road), Cassin’s Vireo, Mountain Chickadee, all three nuthatches, Brown Creeper, Chipping Sparrow, and House and Purple Finches. (Surprisingly, Cassin’s Finch is scarce or absent.) Ruby-crowned Kinglet breeds in the Lodgepole Pine forest at the far northern end of the loop. Red-naped Sapsucker, Willow Flycatcher, and Eastern Kingbird are in riparian areas, while Virginia Rail, Sora, Wilson’s Snipe, Marsh Wren, Common Yellowthroat, Yellow Warbler, and Savannah Sparrow inhabit the marsh, canal, and wet-grass habitats. The refuge can be spectacular in spring when large numbers of migrant Canada Geese, Tundra Swans, Mallards, Northern Pintails, and other waterfowl stop to rest and feed in the flooded fields and shallow lakes. Nesting pairs of Greater Sandhill Cranes are a key attraction. Essentially extirpated from Washington as a breeder, cranes first returned to Conboy Lake in 1979—a testimony to the effectiveness of habitat restoration efforts. Look for them from the observation platform on the trail, or with a scope as they feed far out in the open fields. Black Terns may be present over the marsh and wetland fields in the breeding season during some years. Fields and lakes can be viewed from an observation point at headquarters or by driving the roads that encircle the refuge. The most satisfying view may be from Kreps Lane Road. Leaving the headquarters road, turn left onto Trout Lake Highway. In one mile turn left on Laurel Road to Kreps Lane Road (1.4 miles). Turn left and drive about two miles to where it crosses Chapman Creek. Close studies of Greater Sandhill Crane are often possible in this vicinity. A visitor information kiosk provides a cottonwood and birch hotspot at milepost 15.95, BZ-Glenwood Highway to see close-up views of waterfowl, Northern Harrier, Red-breasted Sapsucker, and Tree and Cliff Swallows. The combination of habitats on the drive up from Toppenish—from shrub-steppe to riparian to oaks, thence into Ponderosa Pine and finally mixed-conifer forests—boasts many birds. Most of the distance to the pass lies within the closed Yakama Indian Reservation. You must bird from the busy highway. Even so, a stop or two in strategically selected habitats should be productive. Lewis’s Woodpecker, Ash-throated Flycatcher, Eastern Kingbird, Bushtit, and Bewick’s Wren are among the many breeding species. At the pass, an unimproved gravel road goes west and uphill. Take the second (larger) of two lefts at the fork in 0.1 mile, then keep right in 1.6 miles. In another 1.8 miles you reach communication towers at a ridgetop with spectacular views of the Cascade volcanoes. The north side of the ridge is forested, while the shallow-soiled south slopes are mostly open—great in spring and early summer for many wildflowers. Birds possible along the road in summer include Sooty Grouse, Turkey Vulture, Northern Goshawk, Red-breasted and White-breasted Nuthatches, Rock Wren, Nashville, Yellow-rumped, and Townsend’s Warblers, Fox Sparrow (especially in Deerbrush), Cassin’s Finch, and Red Crossbill. Listen for Flammulated Owl at night. Williamson’s Sapsucker is fairly common, especially in the mixed-conifer forests past the communication towers. The road becomes very rough, however. Brooks Memorial State Park and campground (Discover Pass required)—2.5 miles south of Satus Pass on US-97—is excellent for breeding birds in Ponderosa Pine forest, riparian groves, thickets, and shrubbery. Look for Cooper’s Hawk, Red-naped Sapsucker (Red-breasted is rare), Western Wood-Pewee, Hammond’s and Dusky Flycatchers, Cassin’s and Warbling Vireos, Brown Creeper, House Wren, Orange-crowned, Nashville, MacGillivray’s, Yellow, and Yellow-rumped Warblers, Black-headed Grosbeak, Purple Finch, and Red Crossbill. Gray Flycatcher is reported from the open pines near the power lines.